What is the function of skin pores? 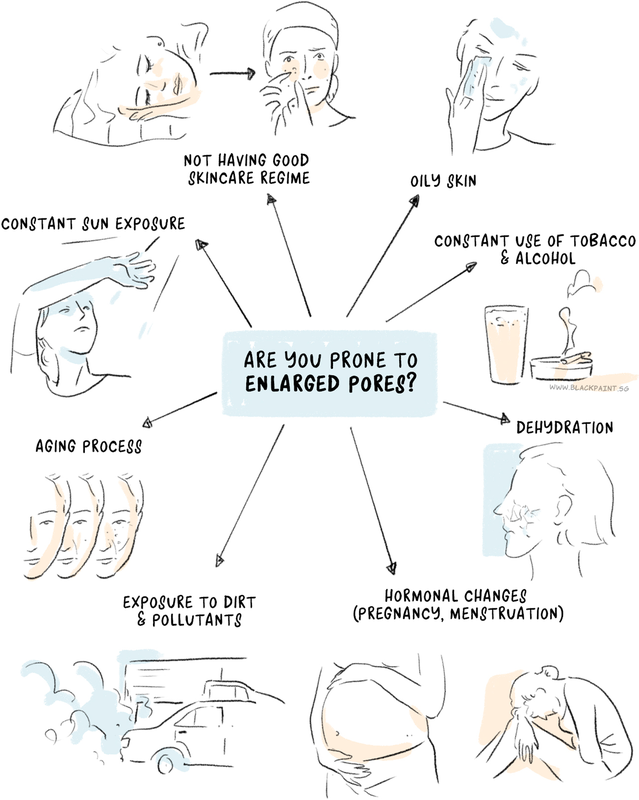 Who is more prone to have enlarged skin pores? 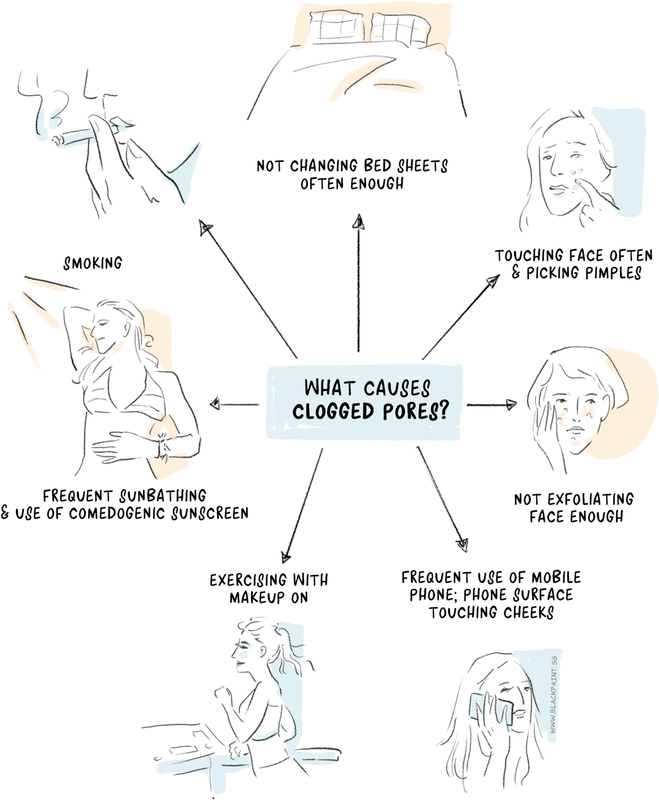 Who is more prone to have clogged skin pores? Hair follicles through which the hair grows and the opening that allows the hair to pass from your skin. They also contain the oil or sebaceous glands and the oil secreted by these glands reach the surface of the skin through these pores. They are present all over your body except the soles of your feet and palms of your hands. Sweat pores that form the openings to the ducts of the sweat glands. They are also present all over your body but they are more concentrated in the groin region, under your arms and on your feet and hands. The healthy skin pores have an important function to maintain the health of the skin. The hair follicles or the oil pores allow the sebum or oil secreted by the sebaceous glands to reach the skin’s surface and lubricate and moisturize it. The sebum is the natural oil of the skin and it helps in keeping your skin supple, healthy, lubricated and moisturized. To have a healthy skin you have to keep the functioning of your oil pores normal. The sweat glands present beneath the superficial layers of the skin secrete sweat that reaches the surface of your skin through the sweat pores. Sweat helps in maintaining the temperature of your body as it takes away heat from your body upon evaporation. There are two types of sweat glands present in your body. The major type of sweat glands is the eccrine glands that secrete most of the sweat. The apocrine glands are present in your groin region and the armpits and they secrete an oilier and thicker type of sweat that causes body odour. Your skin pores may appear larger than normal due to several reasons, including acne, sun damage, increased production of sebum that results in oily skin and using non-comedogenic makeup. Your body secretes sebum, which is an oily substance that prevents the skin from getting dry. If your skin is naturally oily, then you are more likely to have enlarged pores. This occurs because when excessive oil, dirt and dead cells of the skin collect in the skin pores, the skin swells and the skin pores appear larger in comparison to normal. 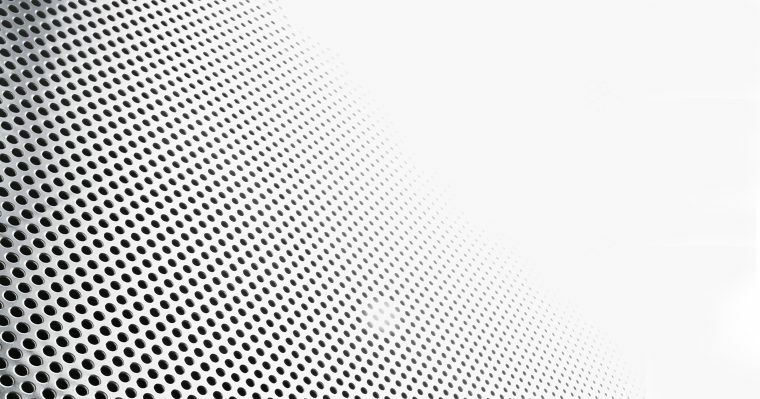 People who have combination skin also tend to have enlarged pores. Another factor that makes you more prone to have enlarged skin pores is increasing age. As your age increases the elasticity of your skin reduces and the collagen present beneath your superficial skin layer (epidermis) is lost. Collagen is an important supporting structure of the skin. When the collagen is lost due to aging, the pores and oil glands lose their support and they become lax. This causes the skin pores to appear bigger and enlarged. In general, men are more likely to have larger skin pores than women. But, hormonal changes in women such as those occur during menstruation, puberty, and pregnancy may cause the skin pores to look bigger. Genetics also plays a role while deciding the size of skin pores. 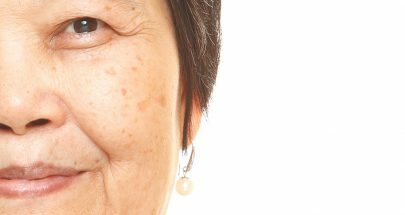 If any of your parents have enlarged skin pores, then it is very likely for you to have them. People who have inherited oily or thick skin from their parents also have a tendency to have large pores. Certain ethnic groups tend to have larger skin pores especially those belonging to Indian and African ancestry. Your skin pores may enlarge when they become clogged with oil, dirt, bacteria and dead skin cells and the sebum accumulates behind these obstructions. This problem worsens if you don’t clean your skin regularly and have poor skin hygiene practices. The dirt and pollutants present in the environment can build up in your skin pores and clog them along with the oil, dead skin cells and bacteria and enlarge them. It is important to clean your skin daily to remove the buildup of dirt and pollutants on your face. Too much alcohol and tobacco also cause a harmful effect on the face, resulting in enlarged pores and blotchy skin. Dehydration or not drinking enough water is one of the common causes of enlarged pores. When your sebaceous glands produce too much sebum or oil, this can clog your pores along with dirt and dead skin cells. This produces swelling of the skin that makes your pores appear larger than normal. This occurs when your skin loses its suppleness and becomes less elastic. In this case, the skin pores appear larger than normal. Too much oil, dead skin cells, and dirt can accumulate in your skin pores and clog them. This can make your pores look larger than normal. Furthermore, blackheads and acne infection that result from clogged pores due to sebum often result in enlargement of pores. The trapped oil or sebum oxidizes and leads to black spots on the surface of your skin. Blackheads may make the appearance of your pores larger or they may actually increase the size of your pores by expanding the pore area. One of the quickest and easiest methods to reduce the appearance of enlarged skin pores is to maintain a routine of cleaning them daily. Use a mild face wash especially with salicylic acid or glycolic acid. These are natural acids that help in removing excess oils and dead cells of the skin. Both of these help in reducing the appearance of enlarged and blocked skin pores. You should exfoliate the skin at least twice a week. It helps in removing the dead cells of the skin from the superficial skin layers and cells clogging the pores; thereby, brightening the texture of your skin. Exfoliation also helps in minimizing the appearance of enlarged skin pores by decreasing the dead skin cells on your face as it prevents the blockage of open pores. The build-up of dead skin cells occurs every six weeks; hence, it is imperative to exfoliate regularly. You can use topical treatments like retinoids, alpha hydroxy acid, benzoyl peroxide or salicylic acid to reduce pore size. They also help in destroying the bacteria that lead to acne and in treating sun damage. A chemical peel utilizes a chemical solution to remove the damaged and dead outer layers of your skin to reveal a softer, fresher, healthier and younger looking skin. Chemical peels can help in improving the size of skin pores, acne, and scars due to acne. In chemical peel, the ingredients used are combinations of beta hydroxy acids and alpha hydroxy acids including glycolic acid, salicylic acid, maleic acid, and lactic acid. Light chemical peel removes only the epidermis or the outer skin layer and results in a healthy glow of the skin. You may repeat light chemical peel treatment regularly to achieve desired results. The medium chemical peel removes cells from the epidermis and the upper part of the dermis. The ingredients utilized for medium chemical peel are Jessner’s solution, glycolic acid and trichloroacetic acid (TCA). Intense Pulse Light (IPL) therapy is also excellent in reducing the appearance and size of enlarged pores. This therapy utilizes photorejuvenation to treat the affected areas. During the procedure, the light is penetrated beneath the surface of the skin on the problem areas. The light helps in stimulating the growth of collagen fibres and in changing the colour of skin pigment. IPL is a relatively painless procedure and only a mild discomfort is felt by most patients. A treatment session lasts for 15-20 minutes. IPL results in tightening of the skin pores and gives your skin a healthy glow and also lightens any brown or red hyperpigmented spots. The recovery is quick with very few adverse effects, the most common being redness of the skin. For desired results, you may require a minimum of two treatments. Laser Skin Resurfacing (Fractional Non-Ablative) works by removing the epidermis or the outer layer of the skin. It also heats the dermis; thereby, stimulating the growth of collagen fibres. After the healing of the treated area, there is the formation of a firmer and smoother new skin. This helps in minimizing the appearance of enlarged pores and acne scars. The recovery from fractional laser skin resurfacing is quick with minimal side effects of mild flaking and redness. You may get long-lasting results even with two sessions of treatments. The major benefit of this therapy is that it heats the skin but does not ablate it. Photodynamic therapy utilizes a light source to reduce the size of sebaceous glands on your face; thereby, decreasing the pore size. Typically one to two treatments may reduce the size of pores significantly along with reducing the signs of sun damage. Your skin pores may clog when the sebaceous glands or the glands that produce oil in your skin start producing greater than normal amounts of oil or sebum. The excessive oil is unable to exit the pores; hence, the openings of the pores clog. Along with the oil, dead skin cells and dirt also start building up in the pores. If your skin is naturally oily, then it secretes excessive sebum. Due to this, too much oil or sebum along with the dirt and dead skin cells start collecting in the skin pores and clog them. Hormonal changes in females that occur during puberty, menstruation, and pregnancy cause excessive production of oil. This also results in the accumulation of oil along with dirt and dead skin cells in your skin pores and clog them. People who use excessive makeup are also prone to have clogging of their skin pores as the extra makeup gets accumulated in the skin pores along with the oil, dirt and dead skin cells and clog them. Not taking good care of your skin also makes you prone to have clogged skin pores. If you don’t clean your skin regularly, then it may lead to an accumulation of dirt, oil, bacteria, makeup and dead skin cells in your skin pores leading to their clogging. Clogging of skin pores is commonly present in adolescents. According to a study published in the journal “Archives of Dermatology,” eating a high-glycemic index diet leads to breakouts of acne. It was concluded by the researchers that the acne increased due to raised levels of insulin-like growth factor and insulin, both of which leads to increased levels of testosterone. Due to raised testosterone, there was an excessive production of sebum. Excess sebum or skin’s natural oil results in clogging of pores. Hence, if you eat a high-glycemic diet that is rich in sugars and simple carbohydrates, it may trigger the excess production of oil, which leads to clogging of pores and acne. Clogging of pores is caused by both heat and humidity and cold weather conditions. The oil production is increased in hot and humid weather. However, in the winter months, low humidity and wind cause dehydration of the skin surface. When the moisture of the skin is not replaced, it produces more oil that may result in clogging of skin pores. Hence, clogging of skin pores occurs in both hot and humid and winter weather conditions. Exposure to environmental pollutants and dirt can accumulate in the skin pores and clog them along with the bacteria, oil and dead skin cells. Prolonged exposure to the sun increases the difficulty of removal of dead skin cells from the surface of the skin. This causes clogging of skin pores. Not using noncomedogenic makeup also clogs your pores as it accumulates in your pores along with the dirt, bacteria, oil and dead skin cells. Noncomedogenic makeup and skin care products are formulated in a way that they don’t cause blockage and clogging of skin pores and breakouts. Noncomedogenic means that does not cause pore blockage or comedones. 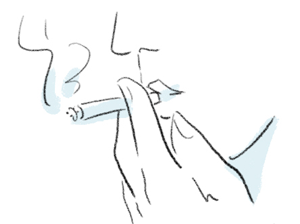 A study published in the ‘British Journal of Dermatology,’ suggests that smoke from cigarettes may clog your pores. The study demonstrates that the risk of adult acne is four times more in smokers in comparison to non-smokers. Bed sheets and pillowcases harbour dirt, dead skin cells, and oil that can transfer back to the skin at night and clog your skin pores. Hence, you should wash your sheets and pillowcases regularly particularly if you sweat heavily. You touch countless materials and objects that are ridden with germs every day such as cash, handrails, sink handles, doorknobs, surfaces of public transport etc. Touching your face often may transfer the many viruses, bacteria, allergens, impurities, and oils from the hands to your skin and this may clog your skin pores. You can reduce the impact of this habit by sanitizing your hands regularly. Tanning in the sun and the damage due to that can result in clogging of pores. Furthermore, many sunscreens, especially chemical sunscreens also clog your pores. It is best to reduce your sun exposure and choose natural sunscreens that contain titanium and zinc dioxide as their ingredients. 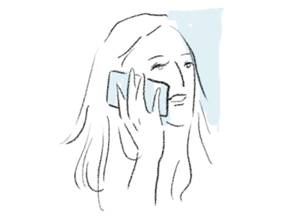 If you talk on your phone regularly and the phone screen is glued to the face, then it may lead to clogging of pores and breakouts on the cheeks and on the sides of the face. Phones are very filthy as they tend to collect dirt, makeup, bacteria and oil from all surfaces they get contacted with. To prevent that, wipe the screen before using it at least once daily or use a hands-free device. Sweating is the body’s natural way of cooling the skin. Wearing makeup while working out can trap bacteria and sweat in the pores; thereby, blocking them. This causes congestion of the skin, which may lead to blackheads, increased breakouts, and skin irritation. Wearing heavy makeup while working out in the gym can lead to worsening of acne and uneven tone of the skin on your face. 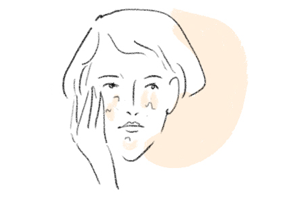 This is a vicious cycle, you pick at your pimples so as to remove them but this action causes even more pimples. When you pick at your pimples, you contribute to irritation and inflammation of the skin, which affects the size of your pores. Furthermore, the stretching and squeezing of the skin transfer the impurities from the hands to your skin, which clogs your pores. Hence, don’t pick at your pimples and use a treatment to get rid of them. When you do not exfoliate regularly, the dead skin cells and natural oils accumulate on your skin and clog the pores. Hence, you should follow a regular routine of exfoliation (at least 1-2 times a week). As already mentioned what you eat is closely linked to clogging of your pores. According to health experts, eating a diet that is not nutritious and healthy can lead to clogging of pores; thereby, causing whiteheads, blackheads, and acne. Eating a diet rich in refined sugars and high glycemic index foods and lacking in sufficient vitamins and proteins may over stimulate your sebaceous glands. They then produce excess sebum that along with the dirt and dead skin cells may clog your pores. Avoid eating high-glycaemic index foods such as white bread, bagels, doughnuts, pretzels, corn chips etc. as they elevate the insulin levels in your blood, which in turn triggers the overproduction of sebum. Excess sebum clogs your pores along with dirt and dead skin cells. Consuming too much milk and other forms of dairy products like cheese, butter, ice cream etc. may also cause clogging of your skin pores. They are rich in natural sugar and may also contain hormonal and other additives that increase the levels of insulin in your body. Increased insulin leads to over secretion of sebum that leads to clogging of pores. Highly processed foods have a high glycaemic index and are rich in sugar. Hence, they increase the levels of insulin in your body, which again leads to clogging of pores. Chocolates are rich in milk and sugar that may increase the secretion of sebum from the sebaceous glands; thereby, clogging your pores. Low-glycaemic index foods such as whole-grain foods. Legumes, dry beans, and pulses. Different types of dried and fresh fruits such as peaches, dates, grapefruits, plums, cherries etc. Vegetables rich in calcium such as kale, soybeans, broccoli, collard greens etc. Foods rich in protein such as fish, eggs, beans, meat etc. Foods rich in vitamins such as carrots, apricots, mangoes, liver, eggs, spinach etc. Healthy fats that are present in avocado, nuts, fish oil etc. Take a fish oil supplement with omega 3 fatty acids. Omega 3 fatty acids help in preventing acne by regulating the production of sebum by the sebaceous glands present in the skin. The omega 3 fatty acid eicosapentaenoic acid (EPA) produces hormones known as prostaglandins that stop the production of excessive sebum by the sebaceous glands; thereby, preventing the clogging of skin pores. By consuming an appropriate amount of fish oil supplements rich in omega 3 you can also relieve the inflammation of your skin from within. Acne occurs due to clogging of hair follicles with dead skin cells and oil. It causes blackheads, whiteheads, and pimples and appears on the forehead, face, upper back, chest, and shoulders. It occurs most commonly in teenagers, though it may affect individuals of all age group. If OTC acne products have not helped you, then your physician may prescribe stronger drugs to control your acne. Acne medicines work by reducing the production of oil; speeding up the turnover of skin cells; fighting bacterial infection and reducing inflammation. The prescription drugs to treat acne may take two to three months before any results are visible. Retinoids and drugs like retinoids. These are available as gels, lotions, and creams. Retinoids are Vitamin A derivatives and include adapalene (Differin), tazarotene (Avage, Tazorac) and tretinoin (Retin-A, Avita). You have to apply this drug thrice a week in the evening and with time you may increase it to once daily. It prevents the clogging of hair follicles. Antibiotics. These drugs work by destroying excess bacteria on the skin and decreasing redness. Examples are clindamycin along with benzoyl peroxide (Duac, Acanya, Benzaclin) and erythromycin along with benzoyl peroxide (Benzamycin). Benzoyl peroxide is added to decrease the possibility of antibiotic resistance. Azelaic acid and salicylic acid. Azelaic acid occurs naturally in animal products and whole-grain cereals. Due to its antibacterial properties, it is an effective acne treatment. It is an option for pregnant and lactating females. Side effects are minor irritation and discolouration of the skin. Salicylic acid helps in preventing clogging of hair follicles. Dapsone. Dapsone 5% gel is found to be beneficial for inflammatory acne when applied twice daily particularly in adult females suffering from acne. Side effects of dapsone are dryness and redness. Antibiotics. You may require oral antibiotics to treat moderate to severe acne. The initial choice is tetracycline such as doxycycline or minocycline or a macrolide. You should use oral antibiotics for a very short time to prevent resistance to antibiotics. They produce best results with benzoyl peroxide and topical retinoids. Combined oral contraceptives. The FDA has approved 4 combined oral contraceptives for treating acne in females who can also use them as contraceptives. These products combine progestin and estrogen (Yaz, Ortho Tri-Cyclen). The benefits are visible after a few months of use. Common side effects are nausea, breast tenderness, and weight gain. Anti-androgen agents. Adolescent girls and women may take the drug Aldactone (spironolactone) if their acne is not getting better by oral antibiotics. This drug blocks the androgen hormones to cause any effect on the sebaceous glands. Side effects are painful menses and breast tenderness. Isotretinoin. It is a potent medicine for people with severe acne that doesn’t get better with other treatments. Oral isotretinoin has serious side effects such as ulcerative colitis, a raised risk of severe birth defects and suicide and depression. Hence, physicians should closely supervise people who are taking this drug. In some cases, certain therapies may be used either alone or along with medicines. Photodynamic therapy and lasers. A wide range of light-based therapies can be used to treat acne with some success. However, further research is required to find out the ideal method, source of light and dose. Chemical peels. This therapy utilizes a chemical solution including glycolic acid, retinoic acid or salicylic acid to remove the superficial layers of your skin. The improvement is temporary; hence, repeated sessions of treatment are required. Extraction of blackheads and whiteheads. Your physician may utilize special tools and remove blackheads and whiteheads that are not cleared with topical medicines. But scarring may result with this technique. Steroid injections. A steroid drug can be directly injected into cystic and nodular lesions to treat them. This therapy results in quick improvement and reduced pain. Side effects are thinning of the treated area. You can control and prevent mild acne by using over-the-counter acne products and taking good care of your skin. Use OTC acne products for oil control and promote peeling. Look for acne products that contain benzoyl peroxide as an active ingredient. This helps in drying excessive oil and controlling acne. You may also try acne products that contain alpha hydroxy acids, glycolic acids or salicylic acids as they may help in dealing with mild to moderate acne. You may see improvement after a few weeks. Some of the initial adverse effects of over-the-counter acne medicines are dryness, scaling, and redness. These symptoms improve within a month of using these medicines. Wash areas having acne with a mild and gentle cleanser. Wash your face and other problem areas with a mild and gentle cleanser and lukewarm water, twice daily. If pimples appear around the hairline, you should wash your hair with a gentle shampoo every day. Also, be gentle while shaving the affected skin. You should try to avoid certain skin care products such as astringents, masks, and facial scrubs as they may irritate your skin and worsen acne. Washing and scrubbing your skin too often may also irritate your skin. Avoid irritants. Don’t use greasy or oily cosmetics, acne concealers, hairstyling products or sunscreens. Use skin care and cosmetic products that are labelled as non-comedogenic or water-based as they have lesser tendency to cause acne. Avoid pressure or friction on your skin. Avoid your skin that is prone to acne from contact and the resultant pressure and friction with items like helmets, phones, backpacks, and tight straps or collars. Protect the skin from excessive exposure to the sun. Your acne may get worse in the sun. Furthermore, some medicines you take for acne may make you more prone to damage from the rays of the sun. If this is the case, avoid the sun as much as you can. Use a non-comedogenic moisturizer with a sunscreen regularly. Avoid picking or touching the problem areas. By doing so you may trigger more lesions or it may result in infection and scarring. Avoid scrubbing or rubbing your skin. Don’t use rough towels on your skin. Take a shower after doing strenuous activities. Strenuous activities result in sweating and accumulation of sweat and oil on your skin may lead to acne breakouts. Hence, you should take a bath or shower after doing strenuous activities. Wash sweaty towels, headbands, caps, and clothes regularly. Wearing them without washing may trigger an acne breakout. Due to excessive heat, blockage of sweat glands occurs, which results in heat rash or prickly heat. This happens as the sweat is not able to get out and builds up beneath the skin. This results in tiny, itchy bumps and a rash. When these bumps burst open and release sweat you may feel a prickly sensation on your skin. Apply cool compresses. Soak tea bags in chilled water and apply to the affected area. Make a paste of gram flour (chickpea flour) in rosewater. Apply this paste to the affected areas. Leave for 10-15 minutes and then wash with cold water. You can also apply a paste of fuller’s earth on the affected areas. Apply cold yoghurt on the affected areas. Leave it for 12-15 minutes. Rinse with water. Mix 1 tbsp apple cider vinegar (ACV) in 2 tbsp of water. Dip a cotton ball and apply with it to the affected areas. Leave for 10 minutes and then wash with water. Add a couple of drops of lavender essential oil in your bath water to relieve the rashes. Wear loose-fitting, light-weight clothes made of cotton. 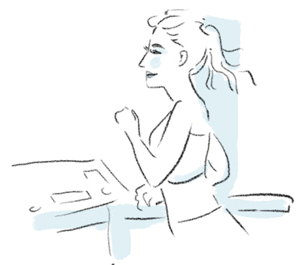 Exercise outdoors in the morning and evening hours when the weather is cool. Keep the skin cool by taking cool showers regularly especially after strenuous activity that causes heavy sweating. 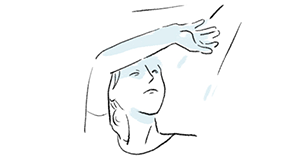 Dry your skin after bathing or showering and swimming. Also remove sweat from your skin, particularly from the skin folds. Don’t apply heavy ointments or creams on your skin as they may block sweat glands. Don’t use harsh soaps in the hot weather. Wear loose clothes at night while sleeping. Also, make sure that your bedroom is properly ventilated. Damask rose is grown primarily in Bulgaria and is the most effective and potent essential rose oil. It may also be used as rose water. This oil improves a wide variety of issues of skin including dullness of skin, excess production of oil and large pores, and helps in cleaning and tightening your skin. Hence, it is suitable for people with oily skin and with enlarged and clogged pores. It is a rich source of antioxidants due to which it also helps in preventing wrinkles and in achieving a younger looking skin. Due to its anti-bacterial and antiseptic properties, it calms the redness, irritation, and inflammation of acne breakouts. Grapeseed oil is available from Vitis vinifera variety of grapes naturally. The oil has a wide variety of benefits for your skin. Grapeseed oil is a rich source of linoleic acid, which the skin requires good amounts to improve its general health and strengthen cellular membranes. This oil helps in improving various conditions of the skin like acne. Due to its antioxidant properties, it prevents the clogging of skin pores. Clogged skin pores may trigger breakouts of acne; hence, by applying Grapeseed oil regularly, you may prevent the occurrence of acne. Due to its anti-inflammatory properties, it helps in treating the existing lesions of acne and reducing the redness and inflammation accompanying acne. Grapeseed oil also works as an astringent and toner. Applying it regularly helps in shrinking the enlarged pores and in reducing excess production of skin oils. So, you have a skin tightening and toning effect. Take a couple of drops of the oil on your fingertips and massage on your body. The oil is quite light and absorbed quickly in the skin. Jojoba oil is derived from the seeds of the jojoba shrub. It is a wax-like substance and may appear yellow or clear. It may smell slightly nutty. Jojoba oil’s consistency is quite similar to sebum, the natural oil of your skin. Sebum plays a vital role in maintaining the general health of the skin by moisturizing it and protecting it from infection. According to a review published in the ‘International Journal of Molecular Sciences,’ jojoba oil has anti-inflammatory properties and due to its waxy texture, it helps in improving the symptoms of a wide variety of skin disorders such as eczema, acne, and dermatitis. Jojoba oil is effective and beneficial in treating skin lesions and acne. According to a study published in the journal ‘Forschende Komplementarmedizin,’ jojoba oil was effective in treating acne lesions including comedones, cysts, and papules in the study individuals. Jojoba oil helps in cleaning the clogged pores and in reducing the size of large pores. Take a few drops of jojoba oil on your fingertips and massage gently on your face. Leave it overnight. Repeat this ritual every night. It benefits your skin as a cleanser and does not clog your pores. Olive oil is extracted from the olives. It has many benefits for general health when consumed as a part of the diet but is also beneficial for the health of the skin. Due to its antibacterial properties, it may be effective in preventing acne. It is also a popular moisturizer that is used for softening hair and skin. Olive oil contains phenolic compounds that have antioxidant and anti-inflammatory properties. These compounds maintain the general health of the skin and prevent any issues related to the skin such as itchiness, enlarged pores, dryness etc. Take a couple of drops of olive oil (extra virgin) and massage it on your enlarged skin pores in a circular motion gently for a couple of minutes. Rinse it off with warm water. You may repeat this one time every day. You may also mix olive oil with sea salt to make a scrub and exfoliate the skin of your body and face with it. Argan oil is effective for improving the beauty and health of your skin. It helps in making your skin softer and firmer and improving its suppleness. Dermatologists recommend Argan oil for enlarged pores as it helps in reducing their size and in making the appearance of the skin smoother. Argan oil contains squalene that helps to preserve the softness of the skin, 80% essential fatty acids that help to improve and reduce irritation of the skin, phytosterols that help to stimulate the production of collagen and phenolic compounds that help to fight the free radicals. It helps in regulating the production of oil or sebum by the sebaceous glands in the skin. According to research, it can reduce the levels of sebum in people with oily skin. Hence, it can help in the treatment of acne. The linoleic acid present in Argan oil helps in reducing the inflammation that accompanies acne. Take a couple of drops of the oil and warm it up slightly between your fingertips. Apply and massage it on your face for a few minutes. 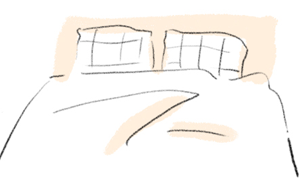 Leave for ½ an hour. Rinse it off with warm water. Repeat this each night before sleeping. Cranberry seed oil is prepared by cold-pressing the seeds of cranberries. Its colour is golden yellow and the smell is faintly bitter or fruity. It is a rich source of essential fatty acids and vitamin E. It maintains the hydration of the skin, keeps it healthy. and helps in treating and preventing acne as it controls the production of excess sebum by the sebaceous glands in the skin. Hence, it is excellent for people who have acne prone skin. It gets absorbed quickly into your skin. Mix a few drops of cranberry seed oil with some jojoba oil and massage it gently on your skin. It is derived by cold pressing the seeds of the sunflower plant. Sunflower oil helps in hydrating, softening and regenerating your skin. By shrinking enlarged skin pores, it removes bacteria that cause acne and improves the tone of your skin. As it is quickly absorbed into your skin, it does not clog the skin pores. It also soothes and calms inflamed and irritated skin and prevents breakouts of acne. Additionally, it is a rich source of linoleic acid, palmitic acid, stearic acid, and oleic acid. Sunflower seed oil also has cleansing properties and helps in eliminating sweat, excess sebum and dirt from the skin. It has astringent effects, due to which it helps in reducing the appearance of large skin pores. 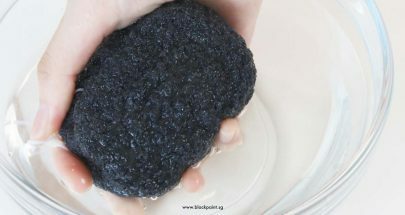 Also called activated carbon, it is a charcoal that has been heated so that it can be used safely for medicinal purposes, including improving and benefiting your skin. It can be used for exfoliation of the skin to remove dead skin cells, excess oil and dirt that can clog your pores. It also helps in balancing the natural oil production on oily skin. 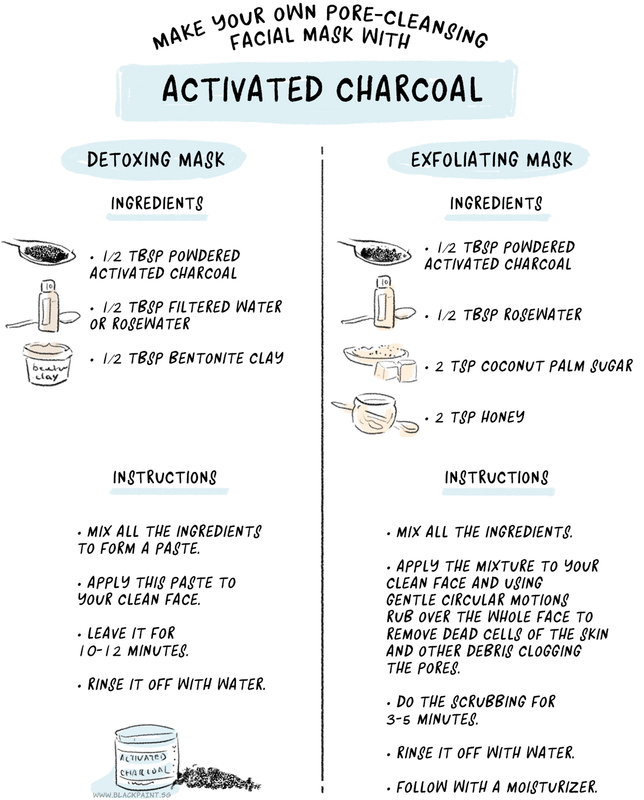 Using a scrub or mask of activated charcoal helps in removing the debris clogging your pores. Furthermore, it also helps in shrinking the appearance of your enlarged skin pores. You can buy activated charcoal either in capsule form or in powder form. The best form of activated charcoal is that, which is obtained from natural substances such as coconut shells. Add a half tablespoon of powdered activated charcoal, regular water or rosewater, and bentonite clay together to form a paste. Apply this paste to your clean face. Mix a half tablespoon of powdered activated charcoal, rosewater, and 2 teaspoons of coconut palm sugar and honey together. Apply the mixture to your clean face and using gentle circular motions rub over the whole face to remove dead cells of the skin and other debris clogging the pores. Do the scrubbing for 3-5 minutes. Macadamia seed oil is extracted from the macadamia nuts. It is a rich source of essential fatty acids, powerful antioxidants, and vitamins. It is natural oil that is excellent for the health and beauty of your skin. Its consistency is medium-thin and it has the ability to penetrate easily into your skin. It helps in cleansing all types of skin including skin that is prone to acne. Using it regularly helps in opening the clogged skin pores. Due to its potent anti-inflammatory properties, it calms the inflammation that associates acne and helps in reducing the appearance of lesions of acne. Since it easily penetrates your skin and doesn’t leave a greasy feel, you can use it to moisturize your acne prone skin. You can mix macadamia seed oil with lavender oil to make a potent anti-acne remedy. It regulates the production of sebum by the sebaceous glands; hence, it helps in balancing and controlling oily skin. If you have acne prone or oily skin, you may use macadamia seed oil as a moisturizer or facial cleanser to normalize the skin. Sweet almond oil is prepared by cold pressing raw almonds so that all natural chemical ingredients are preserved in the oil. It is a rich source of essential fatty acids that act as a natural emollient for your skin. An emollient forms a protective barrier on the skin and locks in moisture. Emollients are particularly effective and protective for skin conditions such as acne, Rosacea, psoriasis or eczema. This oil is quite beneficial for people suffering from acne as it dissolves the sebum produced by your skin; thereby, cleaning your pores and treating and preventing acne. It also improves the hydration of your skin, as well as exfoliating and removing the dead cells of the skin, hence stimulating the growth of younger looking skin. It is used in skin care products to clean your skin pores and to hydrate your skin. Tea tree oil is among the best essential oils that can be used to clear clogged pores. It has powerful skin cleansing and disinfectant properties that help in removing old sebum, dirt and dead skin cells clogging the skin pores. Its astringent properties help in removing the excess oils that block pores and cause blackheads, whiteheads, and acne. The word Lavender is derived from the Latin word ‘lavare’ the meaning of which is to wash. In ancient Rome, lavender was utilized in baths as a cleanser to clean the body. Due to its skin cleansing properties, it removes dirt, dead skin cells, grime and other kinds of impurities from the skin pores. It also has anti-inflammatory properties due to which it relieves and soothes inflamed pores of the skin. Rosemary essential oil detoxes the congested skin gently and cleanses the skin pores; thereby, preventing the formation of blackheads, whiteheads, and acne. It also has potent astringent properties that help in reducing the excess oil of the skin and in reducing the size of enlarged pores. Geranium essential oil helps in clearing clogged skin pores and in fighting acne. Due to its astringent properties, it helps in reducing the size of enlarged skin pores that secrete excessive sebum, which ultimately leads to clogging of pores. Sweet basil essential oil has skin cleansing, antiseptic, disinfectant and astringent properties that help in relieving clogged pores. These properties make it a good oil for both preventing and treating acne. Parsley seed essential oil is obtained by steam distillation of parsley seeds. It is beneficial and effective oil for congested skin and clogged pores. Due to its potent detox properties, it is helpful in removing the impurities and toxins from the skin pores. It also has antimicrobial and antiseptic properties, which help in fighting off germs and bacteria that clog the skin pores and lead to blackheads and acne. The bitter orange essential oil is derived from the fruits of bitter orange. It has the ability to cleanse the dirt, impurities and excess oil from your skin and calms and balances it, without stripping the natural moisture from the skin. It’s ideal for people with oily skin especially for those who have clogged and enlarged pores. However, bitter orange oil may make your skin more sensitive to the rays of the sun; hence, always apply sunscreen while using this oil. Take care while picking your skincare products. Magnesium and zinc help in restoring the oil balance of your skin and in clearing pores and this may make them appear smaller. Skincare and cosmetic products that contain soothing ingredients like lavender and rosemary may relieve irritation and inflammation and prevent stretching of skin pores. Also, opt for products that indicate ‘non-acnegenic’ or ‘non-comedogenic’ on their label. This implies that the product won’t cause clogging of your pores. If salicylic acid is present in the list of ingredients, then the product may help improve the texture of your skin and unclog your pores as salicylic acid exfoliates the skin and removes dead skin cells. Prescription strength retinoids or retinol also helps in unclogging of pores and making them appear smaller. However, you should use these products for short-term as these products have a drying effect on the skin due to which, the sebaceous glands increase the production of sebum to replenish the moisture that is lost. This results in a more oily skin. The best facial cleansers remove excess oil and dirt without completely removing the moisture from the skin. If you have large pores with oily skin, opt for a gel-based cleanser. If your skin is dry or normal, you may use creamy cleansers. Don’t use cleansers containing scrubbing agents or soaps as they may make the pores appear bigger. Wet your face using lukewarm water. Take a small quantity of cleanser and massage it in a circular motion on your whole face for about 30-60 seconds. Rinse with warm water and pat dry your skin. Don’t rub your skin. Repeat the process two times in a day to maintain the health of your pores. 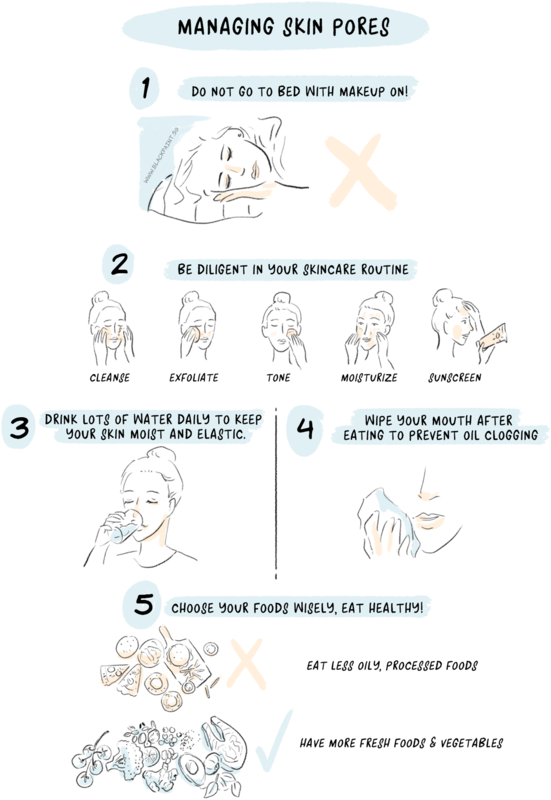 However, take care to not wash your face more than two times a day (in the morning and at night). Washing your face two times is sufficient to remove bacteria and dirt. The American Academy of Dermatology states that extensive washing may increase your chances of developing pimples by irritating your skin and clogging the pores. If your hair is oily, try to keep them off the face and wash them daily so as to reduce the quantity of oil, which rubs off on your face. According to the recommendation by the American Academy of Dermatology, you should exfoliate once or twice a week. Exfoliation helps in removing the dead skin cells that may clog your skin pores without removing moisture from the skin. There are different kinds of exfoliation such as chemical and mechanical. Try products, which have synthetic beads in case your skin is sensitive. Chemical exfoliants contain beta-hydroxy acids (BHAs) such as salicylic acid, alpha-hydroxy acids (AHAs) such as glycolic acid, topical enzymes or retinol to clear your pores. Talk to your dermatologist in case you want to get chemical exfoliation. If you are having a breakout of acne, you should avoid exfoliation to prevent irritating your acne lesions. People who have oily skin often skip moisturization fearing that it may add more oil to the already oily skin. But moisturizers actually help the natural sebum or oil penetrate in the deeper layers of the skin. This helps in reducing the oiliness and also conditions the skin effectively. Without using a moisturizer, your skin may secrete even more sebum. If you have enlarged pores, you should choose a water-based light moisturizer. Sunscreen is essential for every individual and people with oily skin should also apply it every day. Damage from exposure to the sun’s rays not only causes wrinkles and increases your risk of skin cancer but also dries the skin and makes the appearance of your pores bigger. Use a broad spectrum sunscreen with an SPF of minimum 30. Apply it 15 minutes before going in the sun. You may also opt for foundations and moisturizers with sunscreen in them. However, avoid chemical sunscreens and choose natural sunscreens that contain titanium and zinc dioxide as their ingredients. 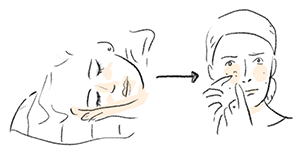 Sleeping without removing your makeup is harmful to your skin. When left on the skin overnight, cosmetics and makeup products may combine with oil, bacteria and dirt present on your skin and clog your pores. This may enlarge them and make them appear bigger the next morning when you get up. Hence, it’s imperative to wash the makeup at night before going to sleep regardless of how late you reach home or how fatigued you are. Use a good makeup remover product to remove your makeup before cleaning your face. Apart from using the correct skin care and cosmetic products, it is also important to stay hydrated as water benefits not only the health of the pores but also the overall health of the skin. Removes toxins from the skin pores. Improves the overall complexion of the skin. You should aim for a minimum of 8 glasses of water or other fluids every day. If you don’t like the taste of plain water, flavour it by adding lemon, berries or cucumber. You can also drink green smoothies, fresh fruit juices etc. to increase your fluid intake. Avoid caffeinated and alcoholic beverages. Steaming the face is a part of a typical facial treatment. A professional uses a steamer and infuses moist, warm air onto the face. This helps in opening your skin pores. Once the pores get open, the skin care professional can apply the treatments such as facial creams and masks more easily and in a much better way as they can be absorbed deeply in your skin. This provides better results. You can go for a facial treatment once a month to open your clogged pores and for an overall improvement of skin complexion and tone. Wipe your chin, face and the area around the mouth while eating greasy and oily foods. The oil present in such foods and that is left as residue on your face may settle on the pores and ultimately clog them. Always wash your hands properly after eating greasy and oily foods as you may transfer the oil with unclean hands to your face and clog your pores. If your skin is excessively oily, then use products containing benzoyl peroxide. This is an active ingredient present in many popular medicines used for acne and is among the most effective remedies for controlling excess oil and preventing clogging of pores. Wear loose-fitting cotton clothes especially in hot weather and while doing strenuous activities. Don’t wear tight hats. Tight clothes and hats may trap sweat and dirt and can clog up the pores. Take a shower after playing sports or exercising to remove the sweat that is present on your skin as it may clog your pores along with dirt, oil and dead skin cells. Foods that are high in unhealthy oils and fats may cause inflammation of your skin leading to clogging of skin pores. Instead of snacking on cookies, candy and chips, eat low-fat, natural foods such as fresh vegetables and fruits. Also avoid consuming high-glycemic index foods such as junk foods, bread, refined grains and foods that have high sugar. You should also avoid highly processed foods. Eat low-glycemic foods such as whole grains, beans, dark green leafy vegetables, and fruits like plums, cherries, peaches, and grapefruit. Black Paint Soap is an effective deep pore cleanser that contains Kishu Binchotan charcoal. It helps in extracting and clearing impurities and blackheads effectively. The charcoal present in it removes the dirt from the pores without stripping the moisture of your skin. It also helps in reducing the formation of blackheads and acne and reducing pore size. You can also use it as a makeup remover during the cleansing process. It contains natural and organic ingredients. A 100% natural facial sponge, it exfoliates the skin of dead skin cells, excess oil, and other impurities from the pores. It is made from konjac fibres that are kneaded with binchotan charcoal and various other minerals. It works by gently pulling all the blockages in the form of excess oil, dirt and dead skin cells from your skin pores. You can use it daily after washing your skin with black paint soap and it leaves your skin feeling clean and smooth. It is suitable for all skin types. The Best Water is odourless toning water that can be used to minimize your skin pores. It helps in restoring the natural moisturizing factor (NMF) of the skin and preventing loss of moisture. It contains 30 different types of minerals, which nourishes your skin and leaves it supple and soft. The minerals also nourish the microflora of the skin that helps in keeping the skin moist. It helps in reducing the size of the skin pores naturally resulting in a hydrated, soft and fine textured complexion. Oil Water Rose is a lightweight facial essence that contains damask rose for tightening of the skin pores. Each bottle of Oil Water Rose contains damask rose water and oil derived from about 2000 stalks of damask rose, which has well-known anti-inflammatory and pore-tightening effects. It also has many other ingredients such as olive oil, Argan oil, cranberry seed oil, and sunflower seed oil that have proven benefits in pore care. All the ingredients present in Oil Water Rose are natural and organic. It helps to keep your skin soft, radiant and supple and regenerates, soothes and protects your skin. Also, it is suitable for all skin types. Water Cream is a water-based dual function moisturizing cream, which protects your skin from dryness and can be used as a makeup primer. It contains Argan oil and other ingredients such as damask rose oil, olive oil, and macadamia seed oil, sweet almond oil and lavender oil – all of which are beneficial in reducing the size of pores and preventing clogging of pores. Additionally, it also protects against the dryness of the skin and maintains the moisture of your skin all through the day, and it is suitable for all skin types. The skin floras are the microorganisms that live on your skin. Many of these microorganisms are responsible for maintaining the health and beauty of your skin by reducing inflammation, acting as a physical barrier to environmental toxins and allergens, limiting your exposure to UV radiation, minimizing oxidative damage caused by free radicals and keeping your skin plump and moist. The Black Paint products for pore care not only contain natural and organic ingredients but also contain ingredients that support healthy skin flora. By supporting and maintaining the health of your skin flora, you will be able to maintain the health and beauty of your skin and skin pores in a better way. Through the experience of a Konjac Sponge user, Serene, this articles goes into the depth of Konjac Sponge. It explains the composition of different types of Konjac Sponge, their particular users and benefits.